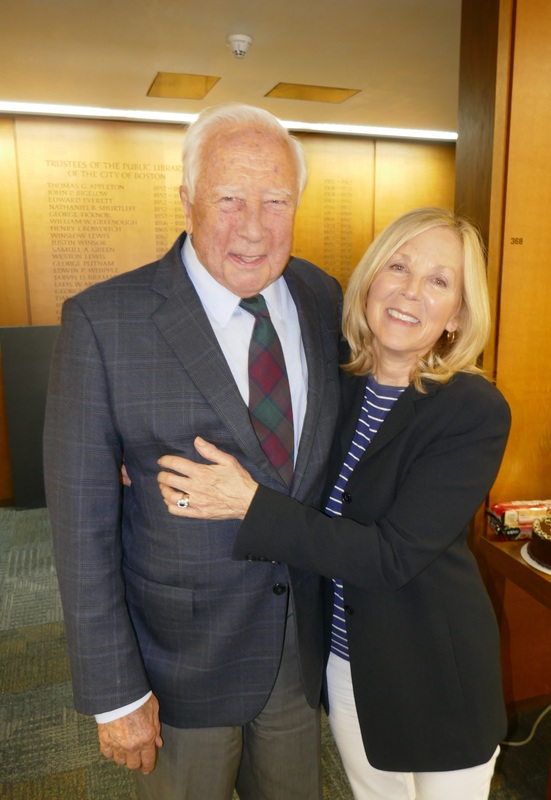 During Vivian’s tenure as Board Chairman she has overseen the Associates of the Boston Public Library’s evolution from a small, grass roots organization with a broad literary mission into a robust non-profit focused tightly upon conservation. Under her leadership, the Associates established the David McCullough Conservation Fund, the William O. Taylor Art Preservation Fund, and the Associates’ Endowment Fund; a writer-in-residence program for an emerging children’s author; three annual signature programs designed to spark public awareness of the BPL as a provider of top quality, free educational resources; and series of presentations by scholars aimed at generating interest in and support for conservation of the Special Collections. She has also helped organize and host the Associates’ annual Literary Lights celebration, an annual black tie dinner honoring outstanding writers from the Northeast that raises money for the McCullough Conservation Fund. Vivian’s passion for libraries and learning has led the Associates to underwrite many exciting projects, ranging from conserving the original records of the Massachusetts Bay Colony, to digitizing a vast and varied collection of anti-slavery records, including the papers of the Boston Female Anti-Slavery Society. In acknowledgement of the impact of Vivian’s chairmanship, the Associates plans to conserve etchings by Giovanni Battista Piranesi (1720–1778), one of the first, fundamental collections of works of art donated to the BPL’s Print Department. Prior to joining the Associates Board in 1998, Vivian served as an Overseer of the Museum of Fine Arts, a member of the Events Committee of the Boston Athenaeum and Chairman of the President’s Circle at Beth Israel Hospital. A former journalist and then owner-operator of a public relations firm specializing in medical and technical accounts, she later worked for Blackside Productions on “Eyes on the Prize II,” the award winning Civil Rights documentary. Vivian and her husband Lionel are residents of Beacon Hill. Vivian’s comments about her successor are as gracious and inspiring as her leadership has been. Vivian is an inspiration for her passion, commitment & energy in establishing the Associates of the Boston Public Library. Libraries are the cornerstone of our community & democracy as best illustrated by the Boston Public Library with its history & resources. And yet, libraries in general & the BPL in particular are taken for granted as already ‘been paid for.’ But it is a living institution that needs public AND private dollars to preserve & maintain its resources. No one knows this more than Vivian who has dedicated 20 years of her talents, networks & insights into ‘educating’ all of us in the importance of THE Public Library. Thank you. And the journey continues with the Vivian’s wonderful example & legacy of her leadership. Become a member of the Associates and join the Associates of the Boston Public Library today!